UPDATED: Norway’s police intelligence unit PST (Politiets sikkerhetstjeneste) was investigating a report on a French website Friday that Denmark and Norway are the next targets of extremist Islamic terrorists. Both Norway and Denmark have been caught in earlier conflicts over publication of caricatures of the Islamic prophet Mohammed, and security was being boosted around Oslo. Norwegian Broadcasting (NRK) reported that police, who only recently started carrying arms because of an already-high terror threat level in Norway, are now carrying automatic weapons instead of pistols while on patrol outside the Norwegian Parliament (Stortinget). There was no confirmation, however, that the heavier arming was tied to the recent terrorist attacks over caricature publication in Paris. Several news media firms in Oslo have also boosted security as has the Islamic Cultural Center and its mosque in Oslo, for fear of reprisal against attacks carried out by Islamic extremists. Meanwhile, both Prime Minister Erna Solberg and Foreign Minister Børge Brende planned to travel to Paris over the weekend to take part in a massive march against extremism on Sunday. Demonstrations against Islamic extremism were also planned in Oslo during the weekend, both outside the Parliament and the French Embassy. TV2 and NRK reported Friday evening that Norway, which has been under a relatively high terror threat level for several months, was identified as “the next” target of extremists along with Denmark. There was little if any substantiation to the report, but PST’s Jon Fitje Hoffmann said the Norwegian terror experts were taking it seriously. Speculation immediately rose that new threat is tied to the publication, in September 2005, of caricatures of the Islamic prophet in the Danish newspaper Jyllands-Posten that enraged Muslims around the world. A small Christian publication in Norway, Magazinet, followed up by also publishing a facsimile of the Danish paper’s caricatures on January 9, 2006. On February 4, 2006, both the Danish and Norwegian embassies in Syria and the Danish consulate in Beirut were stormed by protesters who set them on fire, while Danish and Norwegian flags were burned on the streets. The Danish paper and its artist Kurt Westergaard were threatened as was Vebjørn Selbekk, the editor of Magazinet, and Per Edgar Kokkvold, head of the Norwegian press federation Norges Presseforbundet. The conflict set off a huge debate in Norway pitting freedom of expression against blasphemy. Selbekk has said he felt he became a scapegoat, not least after Norwegian government officials at the time expressed regret that Magazinet’s publication of the caricatures had “created unrest” among Muslims. The current Norwegian government has been stressing the right to freedom of expression this week, also as the conflicts of nine years ago have resurfaced. Hoffmann, who is responsible for PST’s strategic threat assessments, told NRK it was “too early” to characterize the report that Denmark and Norway may be the next targets of a terrorist attack, adding that information about the alleged threat was “completely new.” He said PST was, however, using “a good deal of resources” and working with French terror experts to evaluate the threat. Foreign Minister Brende also told NRK that PST must take the threat, and all threats, seriously. “At the same time, we don’t want to spread fear (because) that’s what the terrorists want,” he said on national TV Friday evening after spending the late afternoon following the dramatic events from Paris closely. Two terrorists who massacred the staff of a French satire magazine were themselves killed by French forces after holding a hostage for several hours. Another gunman who held hostages inside a kosher grocery story in Paris was also killed when anti-terror police stormed the store. Four hostages were reported killed. That’s why he and Prime Minister Solberg have decided to take part in Sunday’s mobilization in Paris, to demonstrate against extremism and in favour of freedom of exprssion. 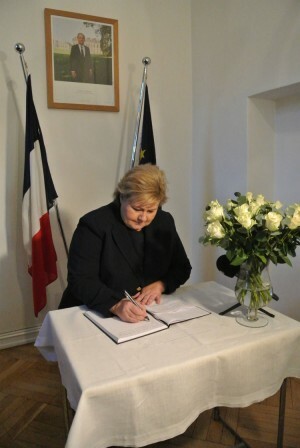 Both Brende and Solberg also visited the French Embassy in Oslo on Friday and signed its condolence protocol in honour of the victims of Wednesday’s attacks.